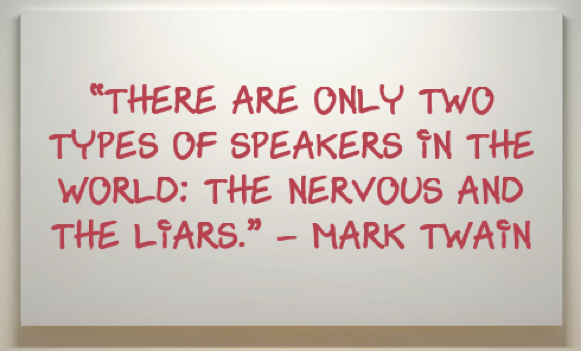 If you’ve ever felt nervous before a presentation – relax, you’re not alone. According to the American Institute of Mental Health, around 74% of Americans suffer from glossophobia, or the fear of public speaking. Just remember that nervousness isn’t going to ruin your speech, in fact, it only really shows that you care. While this feeling may never go away, learning how to manage it is what separates a great speaker from a nervous wreck. The key to a stress-free presentation is to find and customize rituals to set into practice before actually presenting. This is the most important and obvious step. Rehearse your speech several times before presenting, preferably in front of a trusted group of your peers. If the speech feels especially daunting, try to practice it in segments to make it more manageable. As a rule of thumb, if you think you’ve rehearsed enough, rehearse again. Your lines don’t sound rehearsed and you can deliver them without any awkward pauses or mispronunciations. All filler words are gone. Your delivery syncs with the slide transitions. You’re able to deliver the presentation without visuals. You would be excited to sit through this presentation yourself. Science has proven that laughter creates a rush of endorphins, which are then sent to the brain, signaling it to relax. So, before the show, try listening to your favorite comedian’s standup routine. Don’t have one? Our CEO, Kenny, recommends the Comedy Central comedian page to find new material. But, above all don’t be afraid to laugh at yourself. If you make a mistake during the presentation, laugh it off. It will help you recover faster, and it’ll save you from giving off negative energy. Sitting comfortably in silence for 20-30 minutes prior to your talk. Focusing on the air and natural sensation surrounding you (not your fear of the stage). Focusing on slow-paced breathing to control your heart rate. Here is a good video from YogaGlo on a short, 5-minute meditation exercise you can use before any presentation. If you’re particularly anxious before a presentation, breathing exercises can help you control your nerves. Proper breathing, using your diaphragm, will also help you confidently project your voice and maintain a steady pace during the speech. We recommend our clients stand up, leg shoulder-width apart, hands on their stomach, and breathe in deeply, exhaling slowly for 30 to 45 seconds to slow down their heart rate before going on stage. For more advanced breathing exercises, here is a great post from Write-Out-Loud. If possible, get a feel of the room, so there are no surprises during show time. Rehearse on the actual stage and familiarize yourself with how you want to move through certain parts of the presentation. By doing this before your presentation, you’ll be able to speak at a place you know, rather than a completely new space, which can – sometimes – throw off any presenter. And it should be worth mentioning that if you can’t physically be there, ask for a photo of the venue from the event organizer. While public speaking can be nerve-racking, it doesn’t necessarily have to scare you. We’ve listed several ways to manage your nerves, but don’t be afraid to experiment with new and different methods. The goal is to calm your nerves, so make sure to find what works for you. In the end, great communication is a habit. Want to learn more about conquering stage fright? 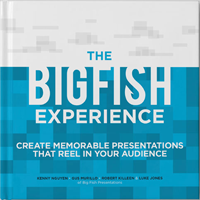 Check out more tips on how to do so in our upcoming book “The Big Fish Experience.” Pre-order your copy here.